Edmonton-Alberta-A sea of colourful dresses and turbans washed over the streets of Mill Woods Sunday during the annual Nagar Kirtan Sikh Parade of Edmonton. The sounds of drums and prayer came from floats and performers as thousands of people walked in warm, sunny weather from the starting point at Gurdwara Mill Woods south down Mill Woods Road. Among those in the parade were federal Infrastructure Minister Amarjeet Sohi and Christina Gray, the MLA for Edmonton-Mill Woods, who has attended since she was elected in 2015. “It’s one of the biggest events in the city, it’s huge and it’s such a great community event when people come out to share culture and everyone is welcome,” Gray said. 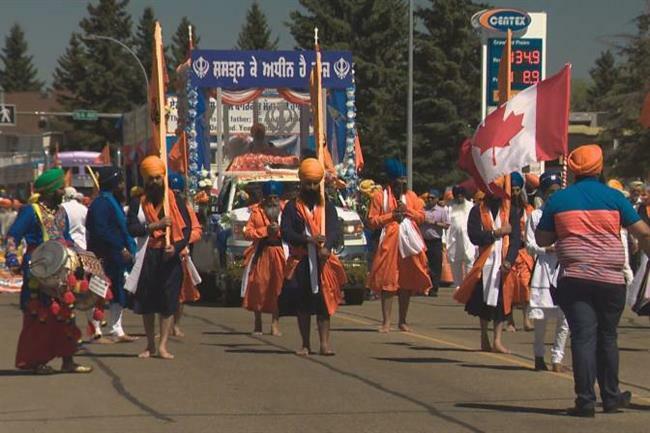 The Edmonton parade, which began in 1999, celebrates the first baptism of Sikh followers in 1699. The event started with an approximately two-kilometre walk to the Gurdwara Siri Guru Singh Sabha, where there were speeches, drinks and food, then continued another two kilometres back to the Gurdwara Mill Woods. People accompany a float in Edmonton’s 20th annual Nagar Kirtan Sikh Parade through Mill Woods on Sunday May 20, 2018. There were half-a-dozen floats as well as performers and members of the growing Sikh Motorcycle Club, which was founded last year. Club member Maninder Dhaliwal said most of their time is spent cruising on their motorcycles, but he really enjoyed the parade. Children were dressed in amazing colours, some carried by their parents and others pushed in strollers, while smiles were met with more smiles along the streets as the crowd followed the event. Gagan Singh Sangha, an Edmonton resident was their with his family and friends. “We celebrate this occasion every year with my family ,friends and my community ,” he said.